All-in-one water cooling systems can now offer PC beautification as much as convenience thanks to the new, oddly named, Thermaltake Floe Riing TT Premium Edition closed loop. Coming with a variety of radiator size options, the new Thermaltake cooling loops pack a number of RGB LEDs into their cooling fans, lighting up your PC’s interior in any color combination you can think of. Although traditional water cooling loops were custom built by hardware enthusiasts with patience and a trust in their own ability to safely seal the loop, all-in-one, closed loop coolers make water cooling a PC much more convenient. Traditionally, they are not too pretty though, with matte-black the color of choice for most of them. Thermaltake does that with its new design but spices it up with some RGB lighting. Available in 360mm, 280mm and 240mm radiator sizes with three and two cooling fans, respectively. The former two utilize 140mm impellers, while the latter comes with 120mm versions. Although there is going to be a performance difference between them, and the ones with larger fans should have a lower noise output, the look of each is similar. The all-in-one’s pump is built into the back of the copper water block, keeping the loop simple and streamlined and all piping is braided with a fabric sleeve to make management easy and to reduce the impact on the case interior’s airflow. They are all connected to the same CPU block, which along with the cooling fans has its own set of RGB LEDs. 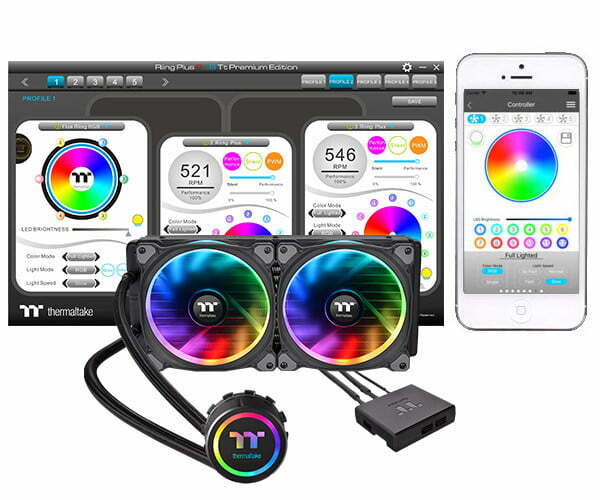 They can all be controlled through Thermaltake’s Riing Plus RGB software and smartphone application, which lets you tweak color outputs, lighting options, add effects, and keep track of information like fan speed, even controlling it manually, if needed. Along with the option for a lighting thermometer function, the app can also issue a warning should certain temperature or fan-speed thresholds be breached, helping you stay on top of any issues with your system while it is in use. The software is linked up with a specialized digital lighting controller box, which can be connected to five devices. They are all controlled by a single lighting controller but you can maintain as many as 16 in the software, so you can easily switch between different lighting modes and profiles. We were so impressed with the features of Thermaltake’s Floe Riing system, that we incorporated one in our brand new AMD Ryzen Threadripper test rig. No U.S. pricing information is as yet available, though Hexus lists system at 225 euros ($265) for the 360mm version, 185 euros ($218) for the 280mm, and 180 euros ($212) for the 240mm.